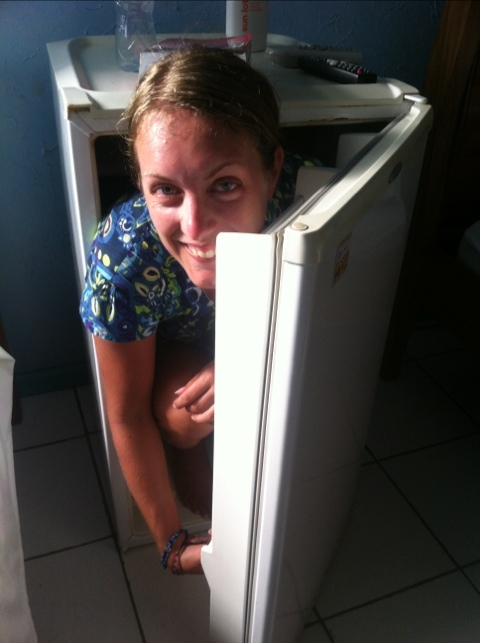 Laura attempting to fit in a fridge! 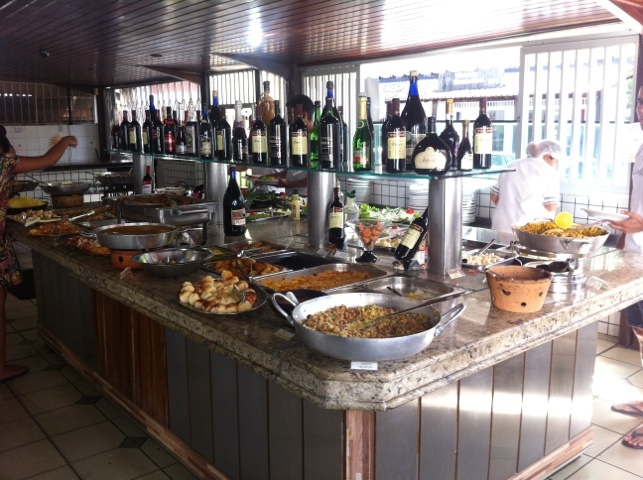 The best way to eat out in Brazil is at one of the buffet style “per kilo” restaurants where you can pile up your plate with a variety of food and pay for what you eat by weight (of the plate not the person). An oddity that we encountered at many of these restaurants was the salad dressing, having doused your lettuce in what you believed to be balsamic vinegar it is a bit of a surprise to taste the salty essence of soy sauce. In a moment of schadenfreude we enjoyed watching other tourists make the same mistake! I wasn’t a huge fan of this dish as it seemed pretty flavourless to me, nevertheless feijao, stewed black beans, seems to be a Brazilian staple. 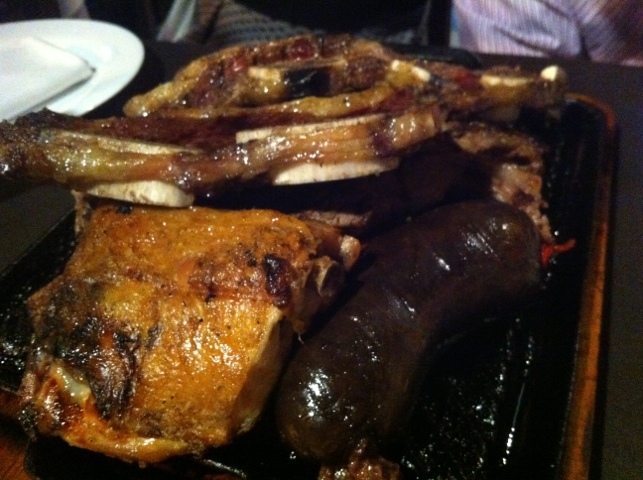 Churrascarias serve up a range of barbecued meats cut straight off the skewer onto your plate. Somehow we managed to pass our time in Brazil without visiting a dedicated churrascaria restaurant (possibly because of the price), but we were able to sample some at the per kilo restaurants, our first foray into the food that South America is famous for – meat. A slushy frozen purple delight, perfect after a day of trekking in Brazil’s heat. 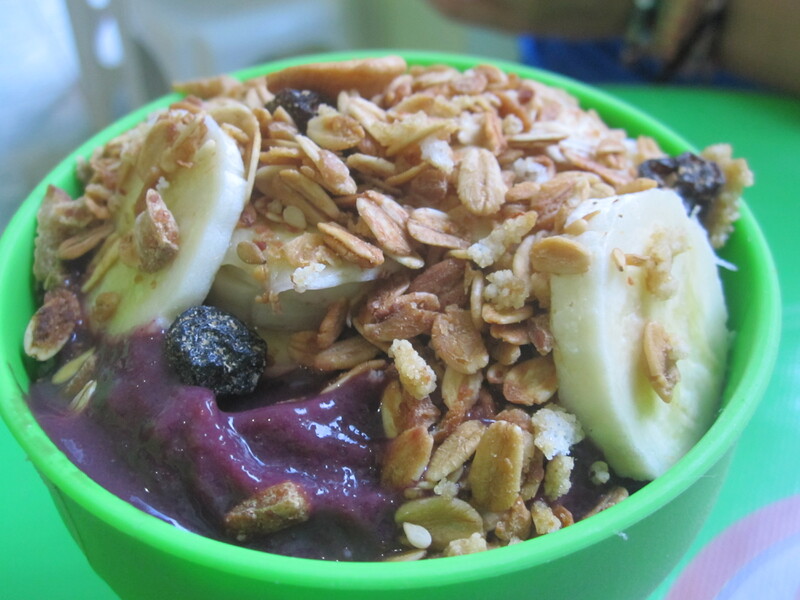 Acai is a blend of ice, acai berries, and if you’re not paying attention bananas (you can usually opt out of this), best enjoyed with a sprinkling of granola. We discovered these incredibly sweet cocktails being sold by a street vendor in the midst of Salvador’s chaotic carnival. 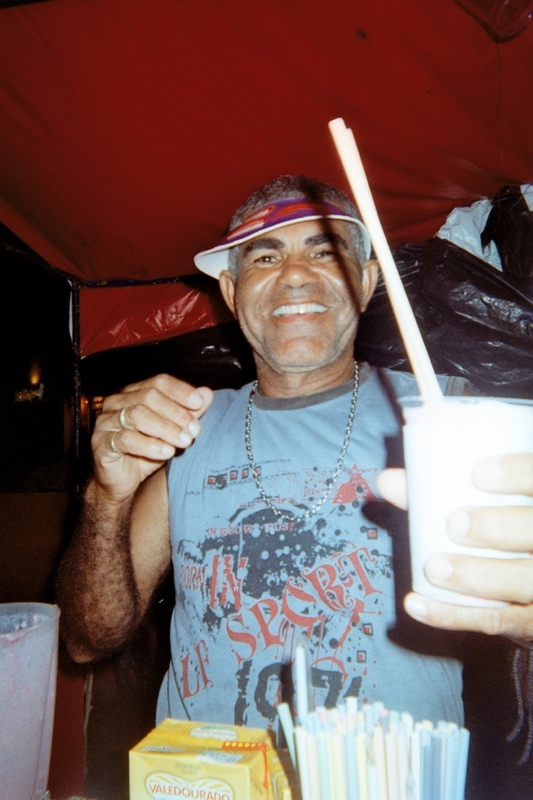 Batidas consist of cachaça, your choice of tropical fruit, condensed milk and some very pink fruit syrup blended together with ice. Brazil’s most famous cocktail made from cachaça, lime juice (although other fruit variants can be found), sugar and ice, needs a good stir and strong alcohol tolerance. In their country of origin these cocktails are mixed with generous measures of cachaça that will definitely leave you feeling worse for wear the following day. If you weren’t a fan of steak before entering the country you definitely will be by the time you leave! 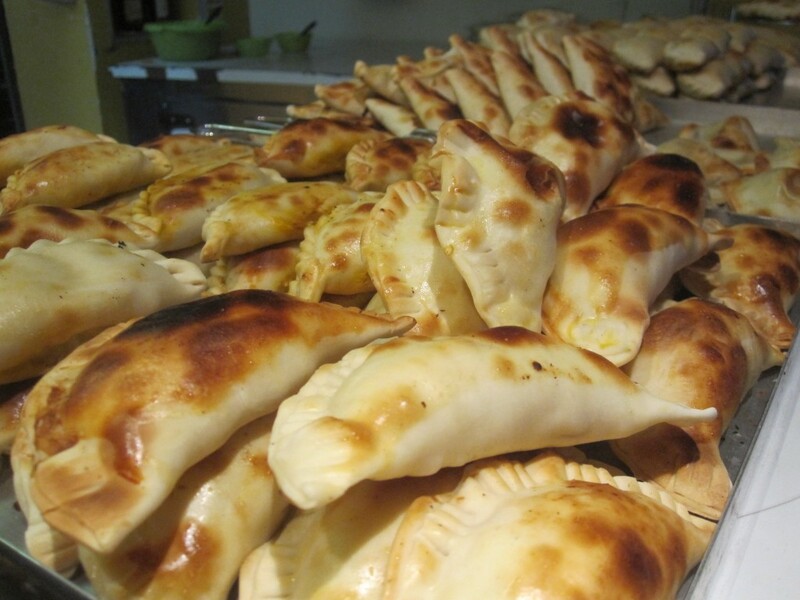 The thick, juicy Argentinian steaks come in a variety of cuts the best of which is bife de chorizo. 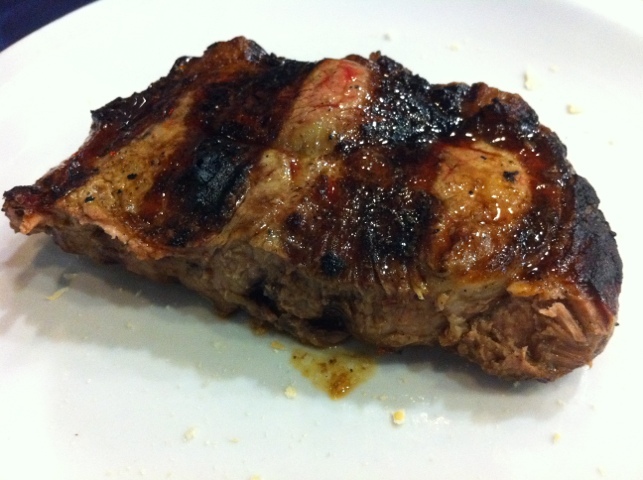 Sometimes a choice of sauces are available but often the steak is served up in its own tasty juices. Sides of potatoes and vegetables are ordered separately and you definitely leave feeling that you’ve eaten enough meat for a week! 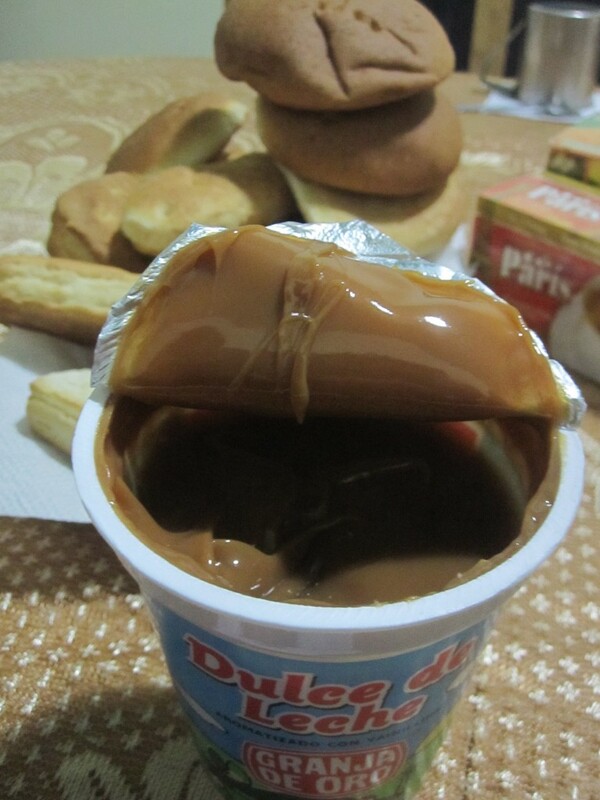 You can’t spend very long in Argentina without encountering dulce de leche. This sweet caramely goo is made from condensed milk and seems to be used ubiquitously in any kind of sweet or dessert. You can easily order an apple cake in the hopes of avoiding the sickly sweet emulsion, only to find a surprise layer of dulce de leche, because really what desert would be complete without it? 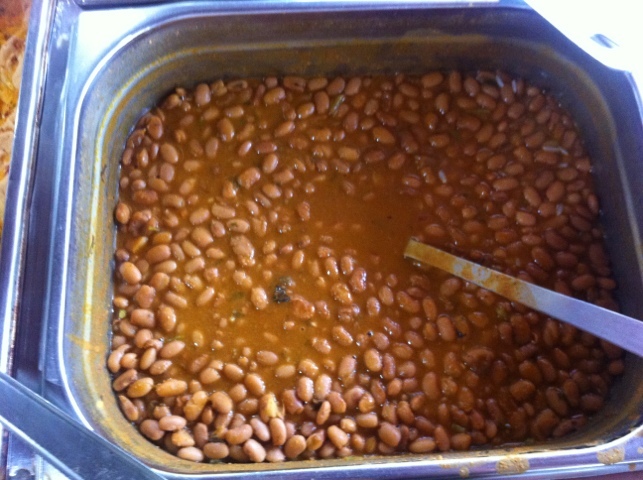 It may seem like a delight at first but after seven weeks you’ll do almost anything to avoid it! 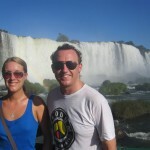 Foz de Iguacu isn’t the biggest waterfall in the world, or even in South America – but it’s probably the best. Mesmerising and awe inspiring, I’ve never seen anything quite like it. However, you have to get there first! We’d not quite prepared ourselves properly, and had left it until the very last minute to race to our 16 hour bus from Bonito in the searing midday heat after a huge all-you-can eat lunch. The trip then necessitated a change of bus and 4 hour wait until the early hours of the morning – at which point we thought we should mark our last night in Brazil with a drink – Caipirinha of course! Surprisingly for Brazil, this was actually quite hard to do, and so we enlisted a fellow traveller to join us and went in search of a bar.Unfortunately bus stations are often on the outskirts of town, and this was no exception. After half an hour of wandering past car dealerships and shopping malls, we went for plan B – do it yourself. A supermarket sold us a bottle of premixed Caipirinha, but it was warm – so we then had a further hunt for ice, including a solo trip for me through a shop with the assistant desperately trying to understand my broken portuguese and offering everything from fizzy water to frozen fish (they were on ice), finally to Smirnoff Ice. I left disappointed, but we eventually found success in the garage down the road, and even managed to get the security guard at the bus station to take a photo of us with our drinks. As the time for our departure rolled round, we were somewhat unimpressed (although merry anyway) at the lack of a bus; it finally turned up 4 hours later as it was beginning to get light – but things went from bad to worse as we were further delayed and the service was eventually cancelled and we were transferred to yet another bus. 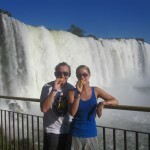 We finally rolled into Iguacu at 3pm, 8 hours late and after a 24 hour adventure across three different time zones! In the few hours of daylight remaining, we headed to the falls. 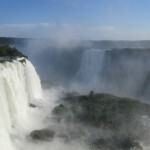 Iguaçu is actually hundreds of waterfalls all together in a 5km stretch of plumetting spray, across different levels of height and with an international border between Brazil and Argentina right down the middle. Each side has a national park at the water’s edge, with walks alongside that means you can experience the full crescendo of awe as you first see the mists of water rising in the distance, hear the deep bass rumble of the torrent, and finally end up right in the middle of the whole thing, soaked to the skin and beaming with pure natural energy. 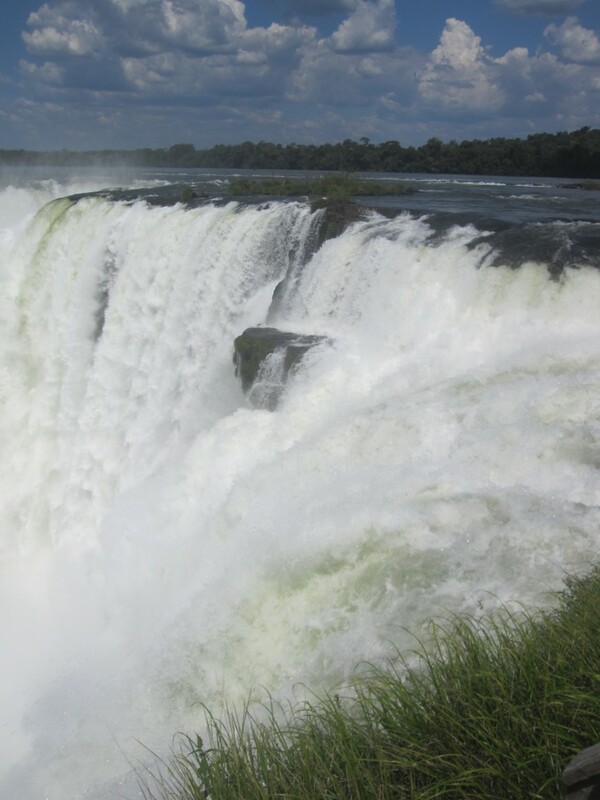 The real highlight is the Garganta do Diablo, the “devil´s throat”, a canyon where the water falls on three sides, creating an incredible sight. We were mesmerised. We then had the fun of crossing the border, unfortunately not an exciting tale of sailing over the falls in a barrel or across the ravine with jetpacks, but instead taking what we feared was the last local bus as night fell. This was all fine until the bus got to the border (15km from the town) and drove off while we did the paperwork. Fortunately after 45 minutes of slightly nervous waiting with some fellow travellers while debating whether we should try and walk it or hitch a lift, our onward transport turned up, and we were into Argentina at last. 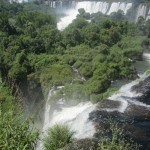 The next day we took to the Argentinian side, which is bigger and impressive, but a bit less immersive – you get to see the falls from the side and the top but not quite all around as in Brazil. 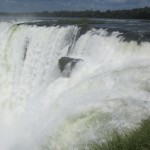 You do, however get a fantastic perspective on the Devil´s Throat, with a platform perched right on the edge. We stayed for a long time, mesmerised by the endless rush of water over the edge, re-emerging as mist from below. It was also somewhat disturbing to see the airborne wildlife struggling to embrace the falls, with a fair few dragon flies, butterflies and birds disappearing into the mists apparently to meet their fate. We read that the birds actually do this all the time, and survive – they seek rocks right in the middle of the falls, and emerge later unscathed. 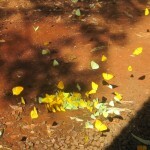 As we were leaving the falls, we came across what from a distance looked like a pile of tortilla crisps lying on the ground; as we got closer we realised they were in fact bright yellow butterflies in their hundreds for some reason gathered round a single spot, basking in the sunshine. Perhaps they were drying off from a plunge off the edge, but for us they were a beautiful end to a stunning couple of days of nature at its best. 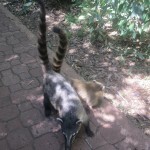 These guys nicked our lunch! 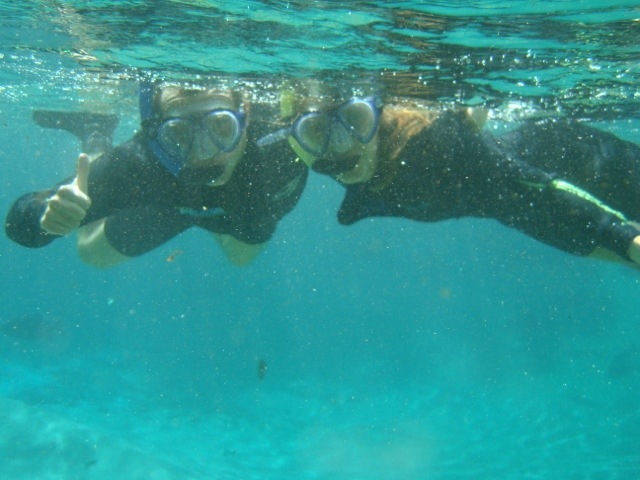 Here´s a video of us snorkeling in Bonito. On our way out of Brazil, we made a quick stop at Bonito, a town to the south of the Pantanal that’s famous for its ecological experiences. 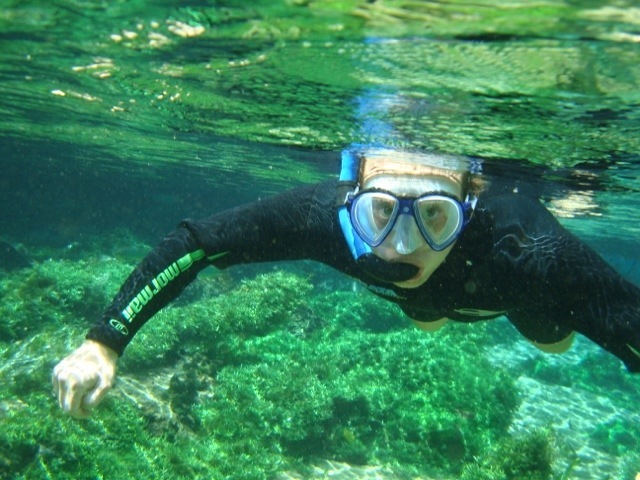 Chief among them, (and the only place we had time to visit) is Rio da Prata, ‘Silver River’, where the combination of minerals means the water is astonishingly clear – with visibility of up to 30m. 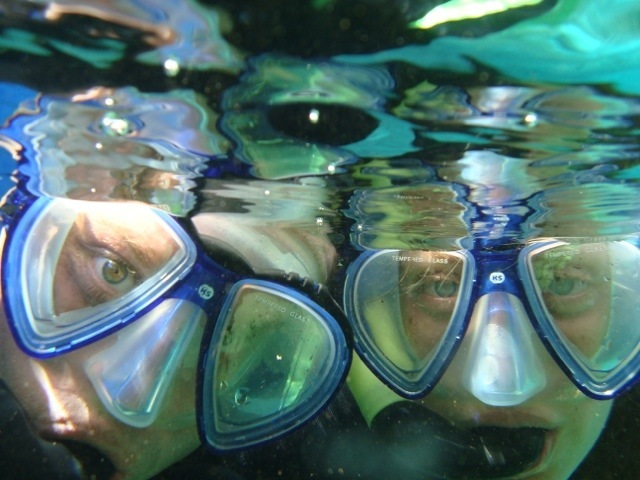 We donned wetsuits and snorkels, hired an underwater camera and floated for about 3km downstream along the surface. 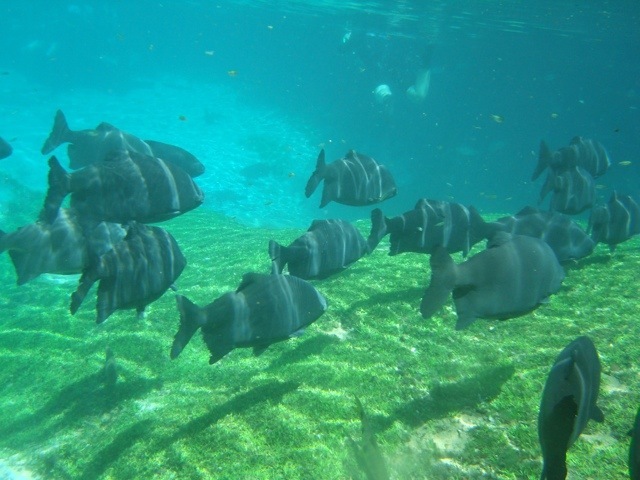 When we first went into the water, we had the slightly odd sensation of being nibbled by the curious fish, but we got used to it, and were soon gawping at the beauty around us. 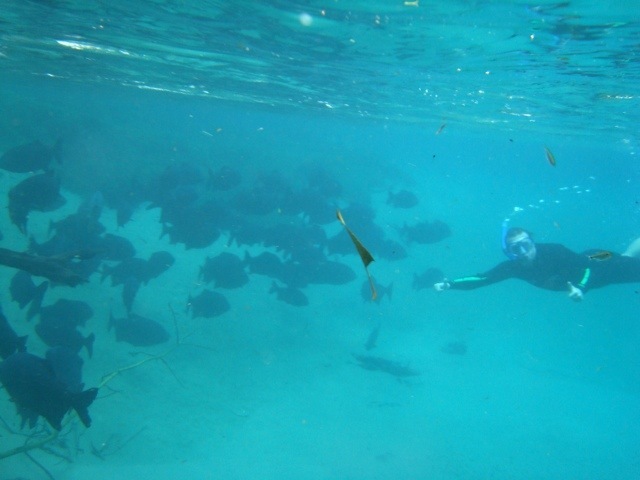 A detailed explanation by the guide in Portuguese was comically translated for us into the simple phrase “Look at all the fishes!”, and that’s exactly what we did! It was undoubtably one of the best things we’ve done in 7 months of travel, and we’d highly recommend it to anyone – thanks Cas for encouraging us to detour! The photos do it more justice than I could ever manage with words alone. You’ve probably heard of the Amazon. 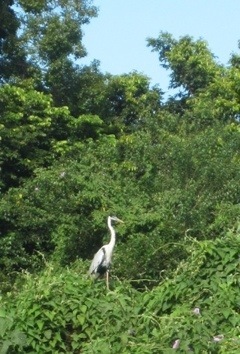 Big river, rainforest, and lots and lots of wildlife. 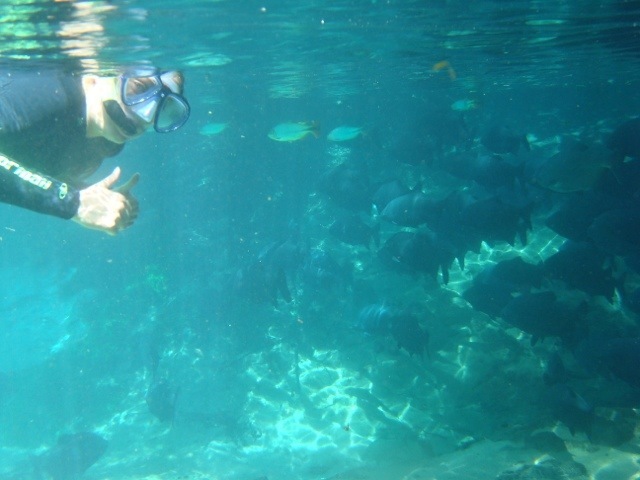 What you might not have heard is that it’s actually pretty difficult to see much of that wildlife without venturing deep into the rainforest, and that is a few weeks of travelling at least if you’re not going to fly. 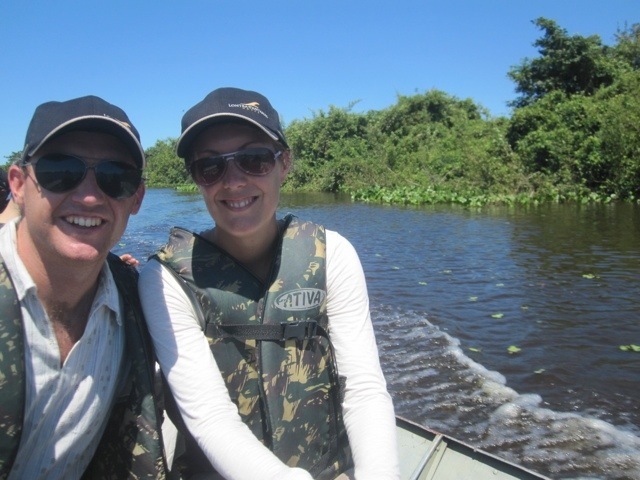 So we instead present The Pantanal, Brazil’s wildlife wetlands that are accessible and are reputed to be the best way to see the wildlife up close if you haven’t got months to spare. Also, it was on our way! 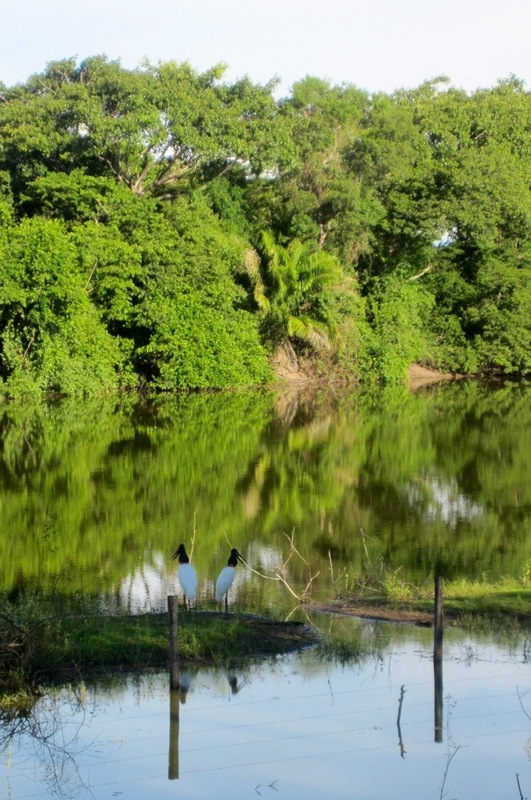 The Pantanal is a huge wetland area on the border between Brazil and Bolivia, 10 times the size of the Florida Everglades. 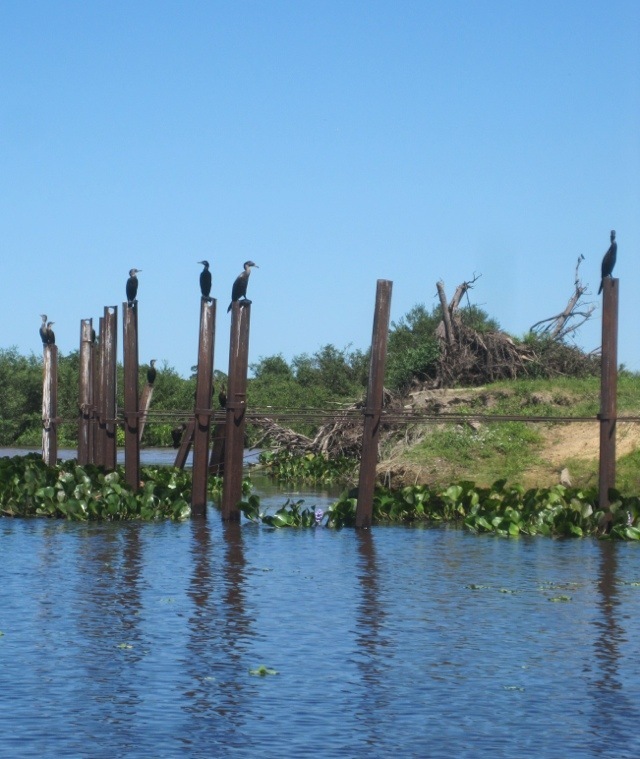 It’s teeming with wildlife, with much of the swampland only accessible by river, and the land owned by various ecological fazendas who subsidise their ranching income (this is cowboy country) through tourism. 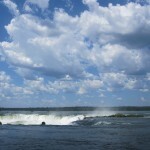 We didn’t have much time, so we opted for a package deal that gave us two nights at a fishing lodge on the riverbank and included a range of activities to sample nature. While we were doing this, nature also sampled us – the mosquitos are voracious, and despite DEET and long sleeves, I ended up with no fewer than 30 bites on my back alone! 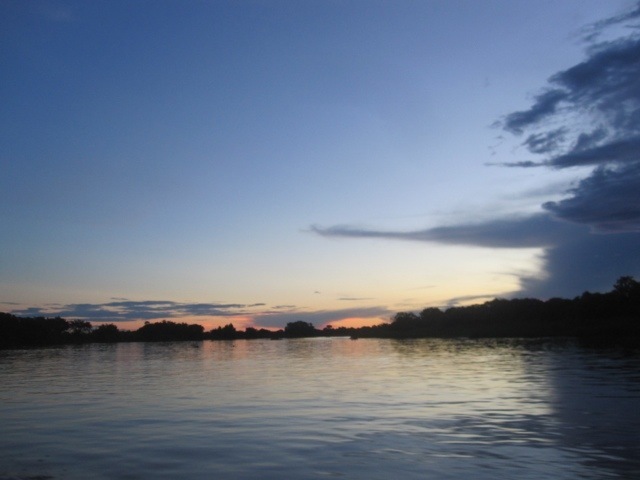 Our first expedition took us on a river safari in a small motorboat for a few hours until sunset. 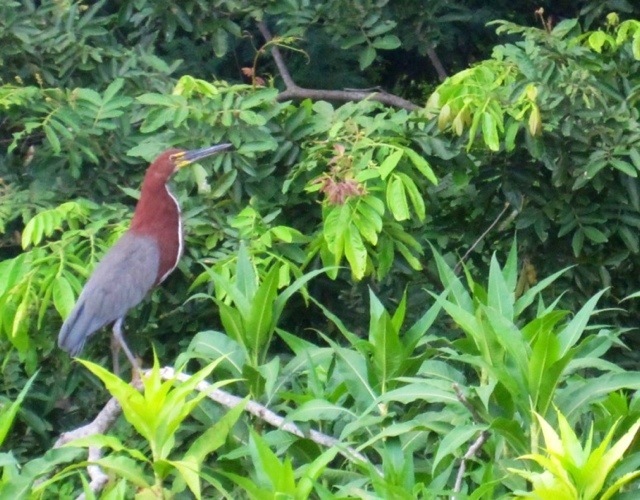 As we cruised along, our guide pointed out innumerable birds of every shape and colour, and we gawped and snapped away on our cameras and feeling inferior to the telephoto paparrazzi madness of some of our fellow tourists. 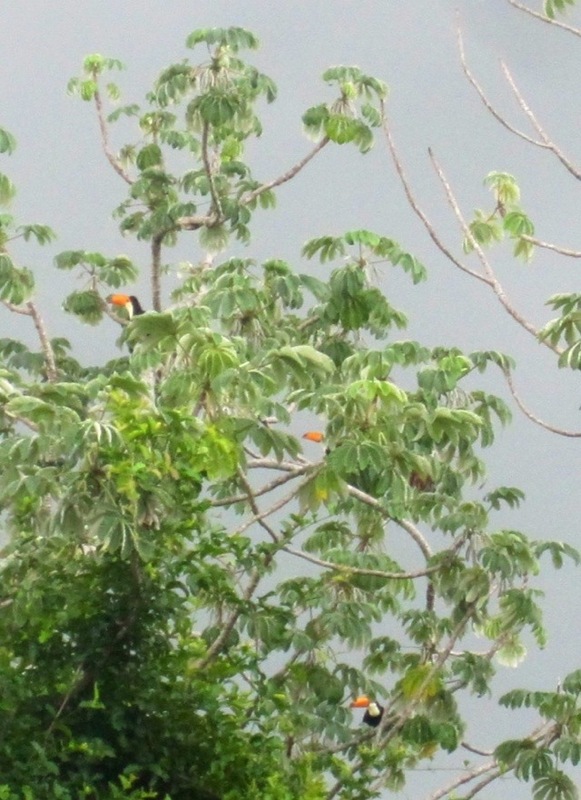 The toucans were particularly memorable, with huge orange beaks, flying surprisingly gracefully through the sky despite their apparent lack of aerodynamics. Every now and again we’d round a corner and find a huge heron basking on the riverbank before they swept into the sky when we got too close. As the sun set, the limited photographic abilities of some of our group came into focus – needless to say, if you want to take a photo of the moon at night, you probably won’t benefit from switching the flash on as one guy did! 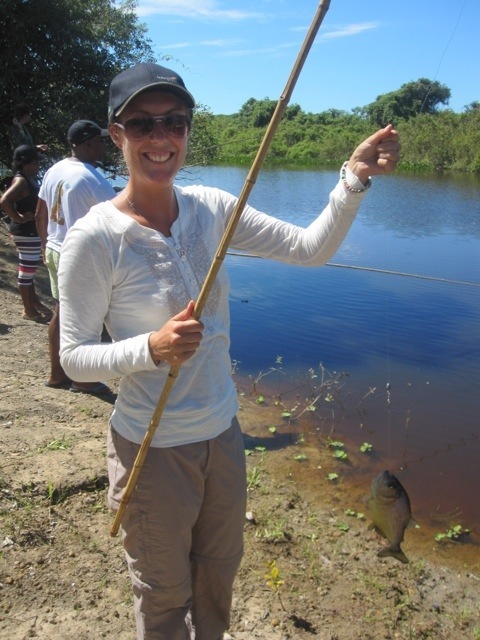 The following morning we got to try our hand at piranha fishing. The location the guide picked for this was a bit of a surprise – the very same river we’d seen people swimming in the previous day! 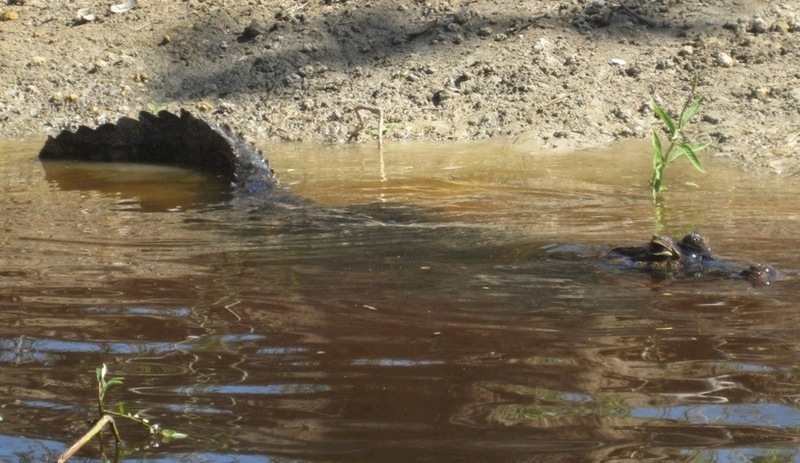 Not only that, but as we headed towards the bank, we spotted a huge Cayman (think alligator) basking in the sun. 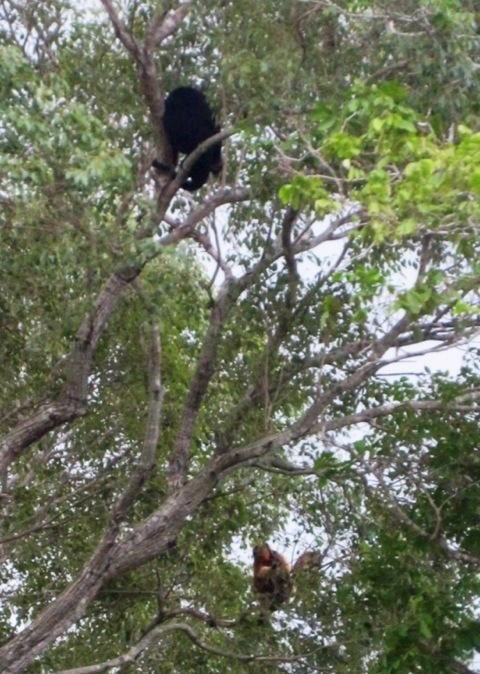 He moved off as we approached, but we felt less than safe as we stepped onto the ground right where he’d just been! The fishing itself consisted of us putting chunks of steak on the hook on our lines and waiting for the fish to bite; at times it seemed more like we were feeding our quarry than catching it, with the fish pretty skilful at eating the bait without getting caught on the hook. 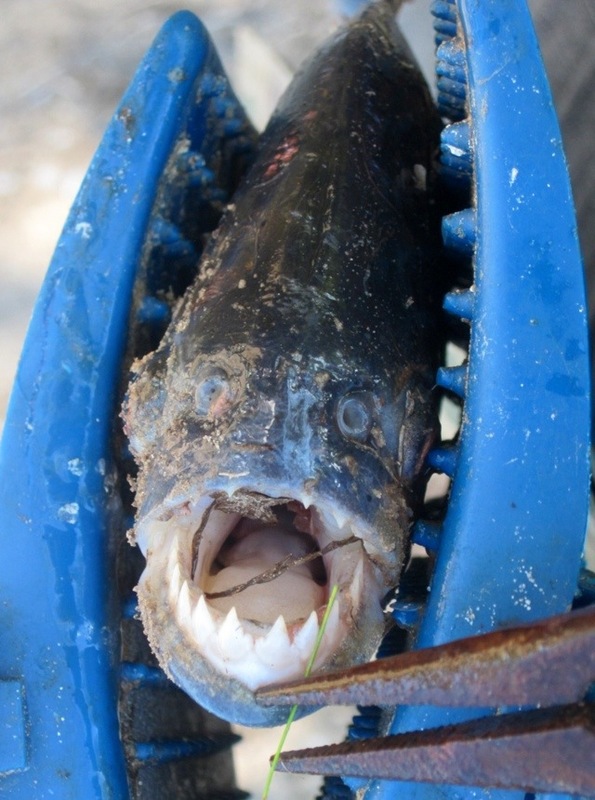 When we did finally get a catch, the piranhas really did look like the creatures of fear they’re reputed to be – a mouth packed with sharp teeth, understandably thrashing around on the end of the line. There was even a special clamp to remove them from the hook to reduce the chance of getting bitten by them. 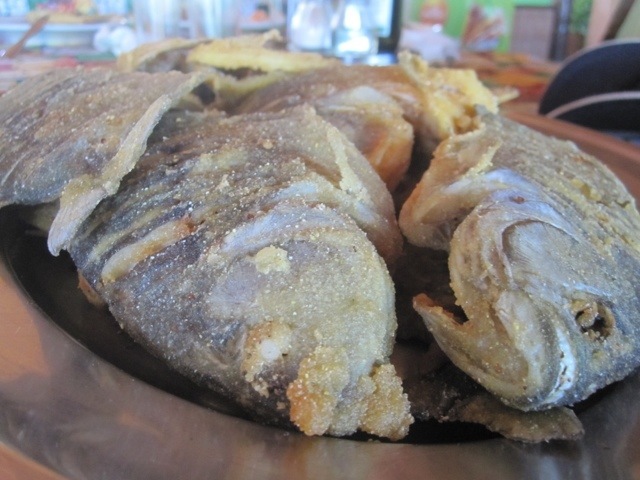 We each caught at least one fish, and then got to taste our catch later at lunch. In the late afternoon, we went on a ‘jungle walk’, a group of us guided through the dense forest tracking various animals and trying not to tread on others. Unfortunately some of the group hadn’t quite got into the spirit of keeping quiet so we could see more, and most of the wildlife kept quite a distance. 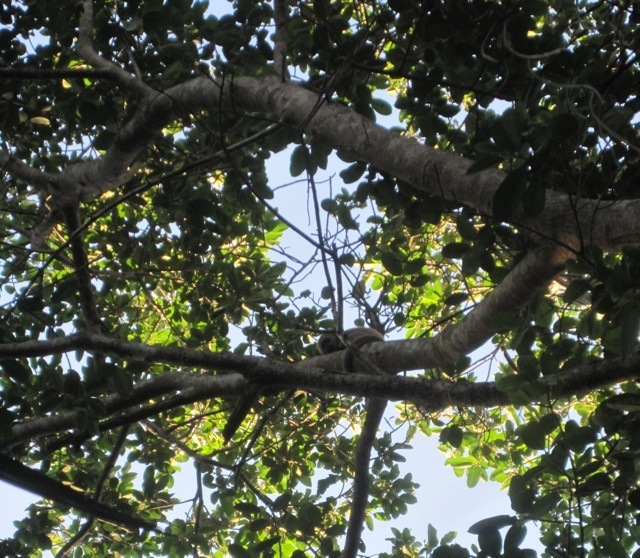 We did however see monkeys in the trees above us, thousands of large red ants emerging through holes in a branch when the guide tapped it, and as darkness fell, a herd of capybara. 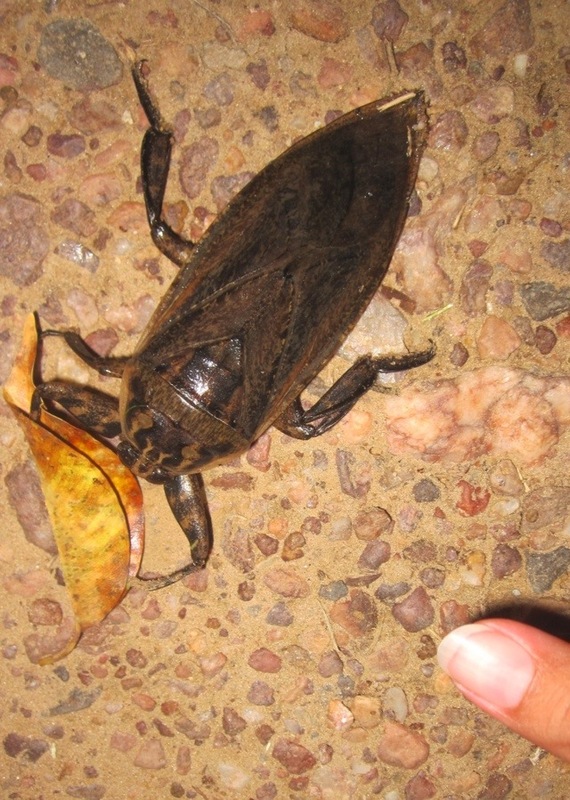 They’re the largest rodent on earth, a bit like a guinea pig the size of an actual pig and with dark brown fur. 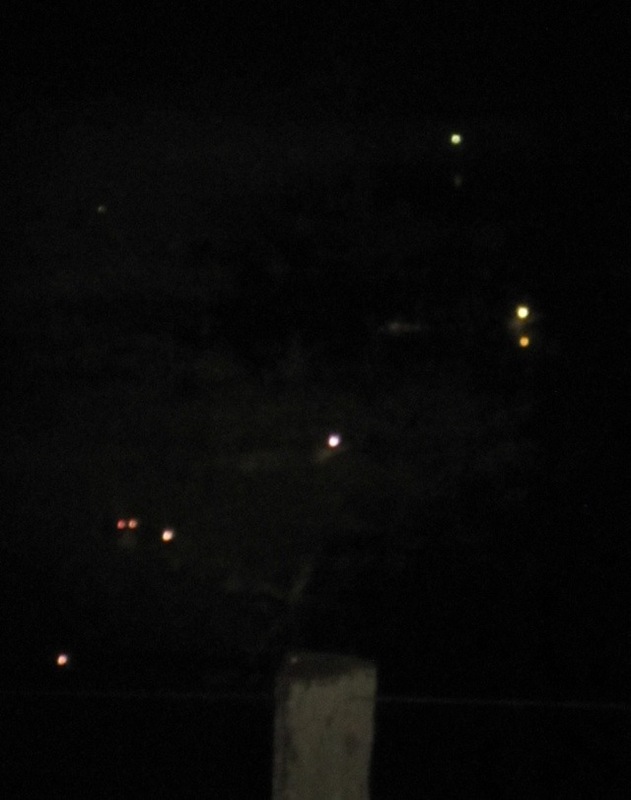 They also moved at speed, and as we approached and they decided to move on, it was slightly alarming to suddenly track fifteen or twenty largish creatures sprinting around us. Although we didn’t see a huge amount ourselves, you got the sense that a lot of wildlife saw us from their places of hiding; as it got progressively darker and the sun set, one couldn’t help but wonder quite how close we were to the various beasts of the jungle surrounding us in their camouflage and waiting to defend themselves if not actually pounce. 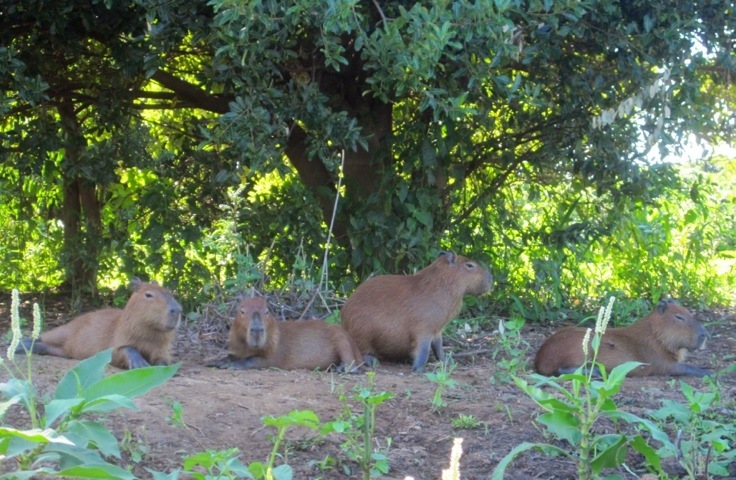 Capybara on the riverbank. They're big! 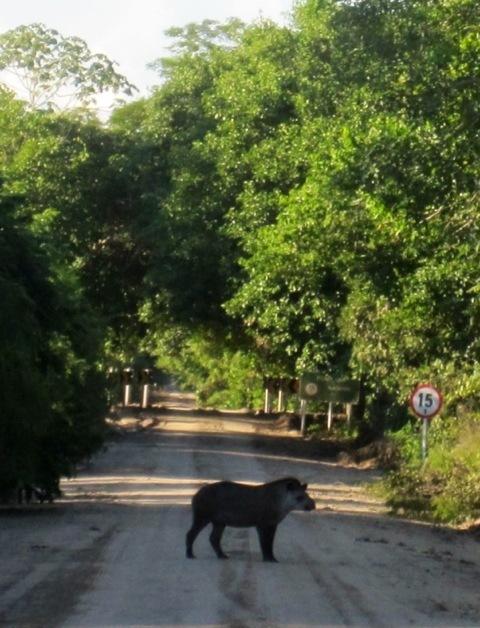 A tapir, one of the five 'must see' animals of the Pantanal. No, we didn't see the others! Our way back along the dirt road that cuts through this bit of the Panatanal was a ‘Night Safari’, which sounds much more exotic than the reality of effectively sitting in a wind tunnel in the darkness with bugs being blasted at you! We were seated safari-style on the back of a pickup truck, with our heads just above the top of the cabin. This meant that anything that flew towards the headlights was deflected by the airflow and ended up flying into our faces. After a few tasters we learned to use our caps to deflect most of the flying protein, but it didn’t make for that great an experience on the hour long journey home! 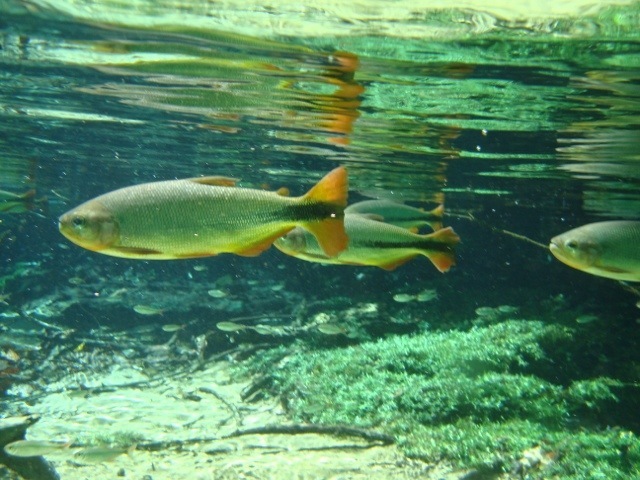 Of the few things the guide pointed out to us with a spotlight, most memorable were the caymans bathing at the river. 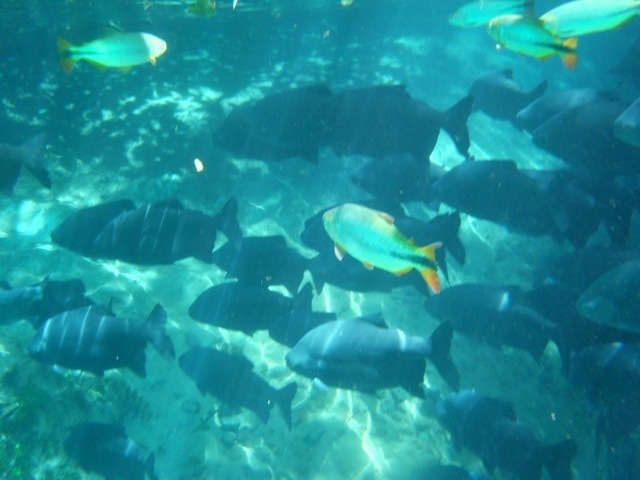 The animals themselves were too well disguised, but their eyes reflected the spotlight, and in one waterway alone we could make out more than 20 pairs of eyes looking back at us from the depths! 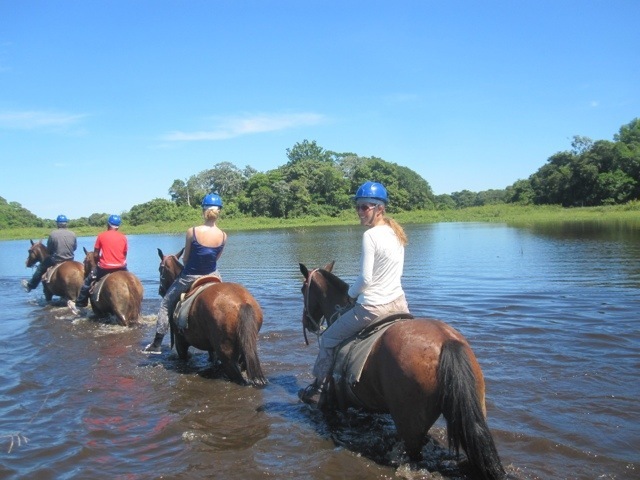 For the final morning of our time in the Pantanal, we went horseriding on a Fazenda. 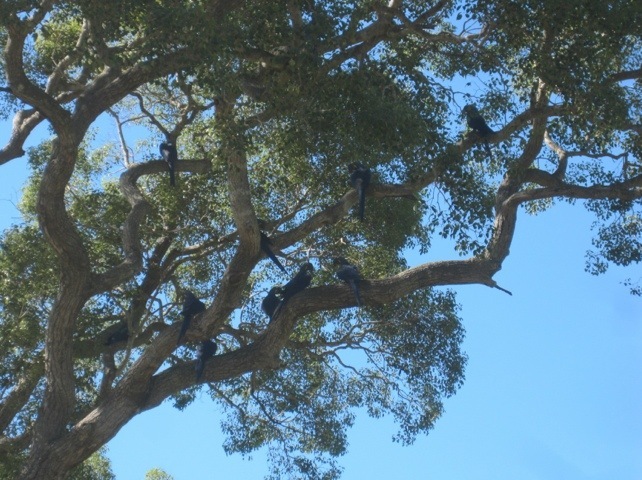 It was fantastic, with blue macaws in the trees around us, and the iconic bird of the Pantanal, the jabiru in some water nearby. 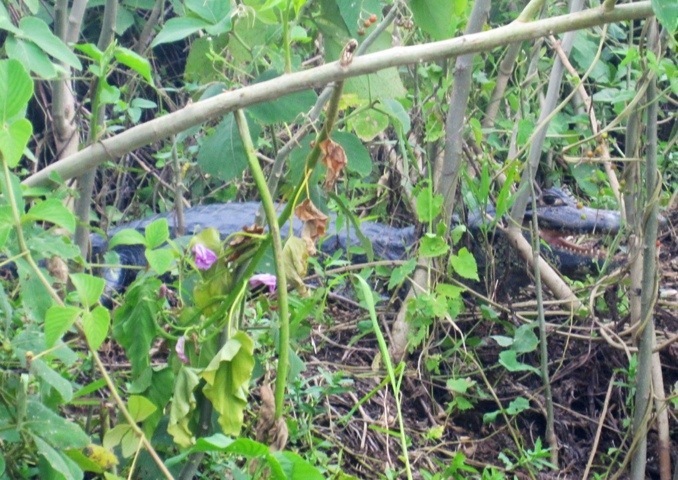 At one point we headed out across a lake, with caiman frantically clearing out of the way as we approached, and the water coming up to our feet on the horse. We’d been warned that the horses sometimes jump around if they become aware of snakes and other dangers nearby, but we fortunately all stayed on and had a great time – absolute bliss.